I’m getting into the groove now. I decided to add even extra texture to this one, so I had to do part of it ahead to let it dry. Then the paint. I love smearing the paint around and applying layer after layer. Thanks to Charlene for such a great word. 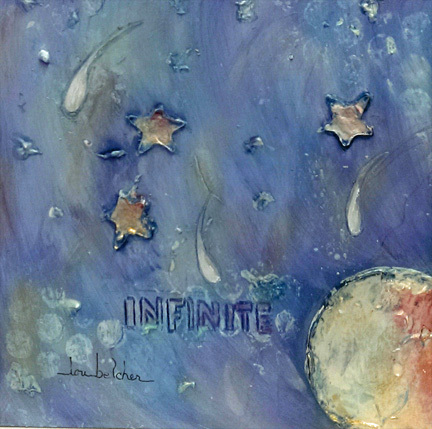 Infinite has many meanings… unboundless, endless, unlimited, immeasurable, etc. Positive, positive, positive… The boys always hope for infinite kibble… but they think a little more on the concrete side than we do. What would your wish be? This entry was posted in art and tagged 59 Words, Infinite, painting. Bookmark the permalink. Oh we love the colors on this one! The colours are fabulous. Have a tremendous Thursday. We love the extra dimension to it! Beautiful word, beautiful painting! Happy Valentine’s Day to you all!